When Pamela and Tony Brown selected the piece of property where they’d build their Prescott home, they chose it because, Pamela said, “the 360-degree view was quite incredible.” That view encompasses Thumb Butte, Granite Mountain, countless granite boulders, and the forest. On one hand, the Browns consider themselves keepers of this “very special piece of land.” And on the other, their home is intensely personal, filled with memories and with items that hold meaning. These two factors come together to result in a home that is peaceful and grounded—and therefore, healthy. Originally from England, the Browns moved to the United States with their young son Jason in 1968. Along with another couple from England, they spent a year in Cambridge, Massachusetts. When their friends moved back home, the Browns struck out on their own, exploring the states in their Volkswagen bus for three months before landing in Berkeley. Still, for these self-proclaimed “60s hippies,” Arcosanti provided a haven of friendship and learning: Tony immersed himself Paolo Soleri’s urban planning concept, and ultimately, used ideas from this concept to plan and build the Browns’ current home. After 13 years at Arcosanti, the Browns moved to Prescott, where they lived in several different houses before and during the construction of their current home, which they spent about 10 years building. They were originally drawn to the lot’s views, and wanted to maintain those as much as possible as they built. The result: the house is unique in structure and layout: the library, living area, kitchen, and bedrooms each have their own levels. The living room window offers a stunning view of Thumb Butte, and the kitchen window overlooks boulders. A tree sits just outside the master bedroom window, “a little moving picture,” Pamela said, and birds and squirrels often play there. Tony and his friends built the steel frames that hold the glass panels throughout the home. The views aren’t just for aesthetics, Pamela said. Pamela believes the animals sense the Browns’ love of nature: birds, deer, javelina, and even frogs hang around the house. They may be after the fruit and vegetables, though: the Browns keep a vegetable garden and an orchard, and, Pamela said, they’ve learned that anything they grow has to be kept in a cage, or the animals enjoy it before the Browns get a chance to. The house is made primarily of steel, concrete and glass, to minimize the dust and maximize the views. Plus, concrete has less environmental impact than quarrying stone, Tony said. They also designed a special system for heating and cooling: windows along the ceiling allow the heat in during the winter, and fans blow that warmer air down into the house. During the warmer months, a set of “doors” or panels close off the windowed area, reducing the amount of space to be heated and helping to maintain the temperature in the living areas. Because the home isn’t connected to the city sewer system, the Browns created a constructed wetlands system (which Pamela said was only the second in the county) to treat the water they use. Constructed wetlands use natural processes involving wetland vegetation, soils, and their associated microbial assemblages to improve water quality (according to the Environmental Protection Agency). 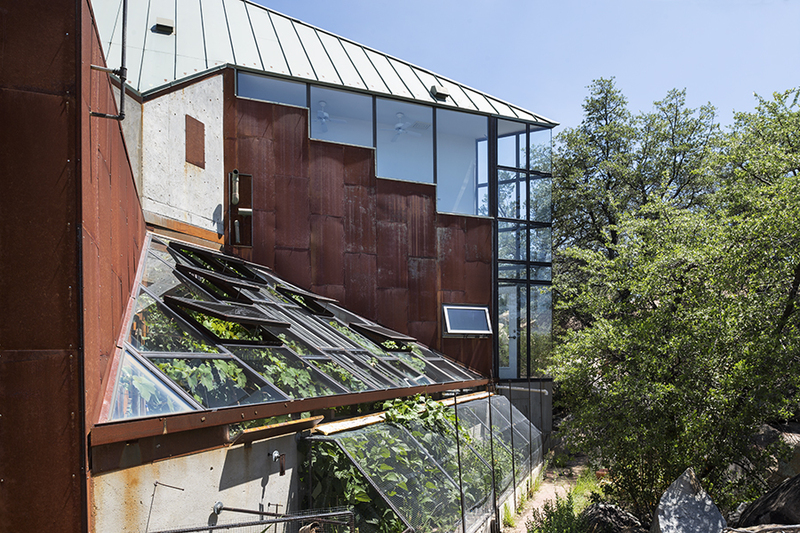 Living and working in Prescott (Tony founded the Ecosa Institute in 2000 to provide cutting-edge ecological design education to restore the health of the planet), the Browns built a network of artist friends. So in addition to Tony’s pen and ink drawings, the home is furnished with pieces made by their friends and family members: paintings, sculptures, photographs, drawings, and more. Pamela’s mom hand stitched the quilt on their bed. The irises in front of the house, as well as the flagstones on the front walkway, came from Primavera School, where Pamela is a teacher. And the bricks on the front porch came from a building in downtown Prescott, which was owned by a friend. “We’re surrounded by our friends,” Pamela said. Tony and Pamela have been married for 55 years. “We’ve had so many adventures,” Pamela said. They moved from one continent to another, with a baby in tow, and later, for three months, they camped every night in a different spot in their Volkswagen bus. They experienced Arcosanti, and “lived in every street in Prescott” while raising their son. Now, they’re living perhaps the greatest adventure: enjoying a home they built themselves, surrounded by nature, cultivating peace of mind. Prescott is a city in central Arizona. Downtown, historic Whiskey Row is known for its bars and live music venues. The Sharlot Hall Museum documents the region’s pioneer-era history. The Smoki Museum exhibits artifacts from indigenous peoples of the Southwest. To the northeast, Watson Lake is home to hundreds of bird species, and a circuit of trails runs among the granite boulders dotting its shore.